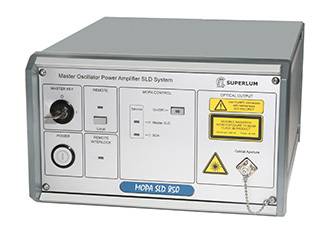 The Superlum MOPA-SLD-850 is an ultra-high power SLD-based light source that features both high power levels (tens milliwatts) and an extremely weak sensitivity to optical feedback. This is achieved using a special optical scheme called MOPA (Master Oscillator Power Amplifier). A simplified block diagram of the MOPA scheme is shown in the figure below. A medium-power SLD operating as a master source provides an optical power of 6 – 10 mW with a relatively broad spectrum of 10 – 20 nm centered at 850 nm. After passing through an appropriate optical isolator with an isolation of better than −25 dB, the power is elevated to a high level of 50 mW by a spectrally matched Semiconductor Optical Amplifier (SOA). The key advantage of such an optical configuration is its weak sensitivity to optical feedback, because the input power of 6 – 10 mW makes it possible for the SOA to reach a deep saturation level. In this situation, there is no need to install an optical isolator at the output of the SOA for protection from optical feedback. In addition, this allows eliminating any unwanted power drop related to insertion loss inside the isolator, which frequently reaches 2 dB. Another advantage of the MOPA scheme is that it uses only the polarization maintaining optical fiber — no SM-fiber coupled components are utilized. Most of the fiber-optic components are built on the fast-axis-blocked technology that guarantees high values of the PER (Polarization Extinction Ratio) at the MOPA output (> 18 dB). Block Diagram of the MOPA Optical Scheme (Simplified). SOA – Semiconductor Optical Amplifier. OPM – Optical Power Monitor. APC – Automatic Power Control. For more details, please refer to Superlum application note "Boosting of SLD Power. Feedback-Insensitive, Ultra-High-Power MOPA SLD Sources ". The MOPA system is offered in a compact metal case which can be used on a lab bench or in a rack. The instrument consists of a modular mainframe and several plug-in modules (power supplies, optical unit, current and temperature controllers, CPU etc.). Each MOPA system is equipped with a high-precision PM FC/APC optical socket for easy coupling of 2.0-mm narrow-key connectors. The device is supplied with a 1 m PM optical patch cable (other lengths are available upon request). The Superlum drive electronics includes two independent, high-precision, low-noise, constant-power current & temperature control drivers. The electronics provides safe current and temperature operation of the master SLD and the SOA. All the necessary SLD protective measures are implemented. Among the measures, the most important ones are the soft start, turn-on transient suppression, overtemperature protection, open-circuit protection and pumping current limit. The MOPA-SLD-850 can be operated locally from the front panel, or remotely from a computer with an RS-232 port. It contains minimum front-panel features needed for operation. No adjustments are required to run the device because it is completely pre-set at the factory. The rear panel of the instrument has a digital input to allow the drive current of the SOA to be pulse modulated (switched on or off). The maximum frequency of modulation is 50 kHz. The device includes a linear power supply capable to operate from 220 VAC or 110 VAC. The required value of the line voltage is pre-set at the factory and should be specified by the customer when placing the order. SLD-based light sources are excellent high-power speckle-free broadband light sources with a great potential for using in many practical applications such as OCT (Optical Coherence Tomography) Imaging Systems, FOG (Fiber Optic Gyroscopes), optical spectroscopy and the others. For added safety, the system is designed to meet the laser safety requirements for class 3B laser products. Accordingly, the instrument incorporates the laser safety measures specified in IEC 60825-1 Ed. 2 2007-03, namely: the master key control, remote interlock connection, visual/audible alarm, information and warning stickers etc. Information and warning labels as specified in IEC 60825-1 Ed. 2 2007-03. Superlum offers product customization services. A number of the operating characteristics of the product (e.g. the output power level, spectral characteristics etc.) are available for modification according to your specific needs. Please contact us for further discussion of your requirements. Technical Product Specification (PDF, 78 KB). Operation Manual (PDF, 256 KB). Application Note "Boosting of SLD Power. Feedback-Insensitive, Ultra-High-Power MOPA SLD Sources." (PDF, 78 KB). • Technical Product Specification (PDF, 78 KB). • Operation Manual (PDF, 256 KB). • Feedback-insensitive MOPA SLD Sources (PDF, 78 KB).